Anhydrous ammonia is the compound formed by the combination of the two gaseous elements, nitrogen and hydrogen, in the proportion of one part of nitrogen to three parts of hydrogen by volume. Since one volume of nitrogen weighs fourteen times as much as one volume of hydrogen, on a weight basis, the ratio is fourteen parts of nitrogen to three parts of hydrogen, or about 82% nitrogen and 18% hydrogen. 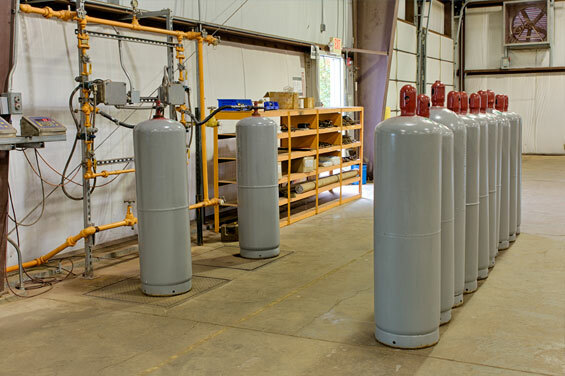 At atmospheric temperature and pressures, anhydrous ammonia is a pungent colorless gas. Anhydrous ammonia boils at -28°F and freezes to a white crystalline mass at -108°F. When heated above its critical temperature of 270.3°F, ammonia exists only as a vapor regardless of the pressure. Between the melting and critical points, liquid ammonia exerts a vapor pressure, which increases with rising temperature. When liquid ammonia is in a closed container, it is in equilibrium with ammonia vapor and the pressure within the container bears a definite relationship to the temperature. Liquid anhydrous ammonia is lighter than water, having a density of 42.57 pounds per cubic foot at -28°F, while as a vapor, ammonia is lighter than air, its relative density is 0.597 compared to air at atmospheric pressure and a temperature of 32°F. Under the latter conditions, one pound of ammonia vapor occupies a volume of 20.78 cubic feet. At 70°F and at atmospheric pressure, one pound of ammonia vapor occupies a volume of 22.5 cubic feet and yields 45 cubic feet of dissociated gas at a ratio of 25% nitrogen and 75% hydrogen. Because of its great affinity for water, care must be taken in the storage and handling of ammonia to keep it dry. "Anhydrous" means "without water." When ammonia gas is dissolved in water, the resulting material is ammonium hydroxide, or "aqua" ammonia. The two materials should not be confused. Vapor density at -28°F and one atmosphere: 0.056697 lb/cubic ft. The common metals are not affected by dry ammonia. Moist ammonia will not corrode iron or steel, but will react rapidly with copper, brass, zinc and many alloys, especially those containing copper. Only steel or ductile iron should be used for ammonia containers, valves, fittings and piping. Under normal conditions, ammonia is a very stable compound. It takes excessive temperatures (about 840° to 930°F) to cause it to dissociate slightly at atmospheric pressure. When this happens, the dissociated products are nitrogen and hydrogen. Ammonia gas burns in a mixture with air within a limited range. The flammable limits at atmospheric pressure are 15% to 28% by volume of ammonia in air. Experiments conducted by Underwriters Laboratories indicate that an ammonia-air mixture in a standard quartz bomb will not ignite at temperatures below 1562°F. When an iron bomb, having a catalytic effect, was used, the ignition temperature dropped to 1204°F. The following sources of information on anhydrous ammonia are recommended. Dissociated ammonia is frequently used as a furnace atmosphere for heat treating metals. Dryness is an important factor. It is difficult to measure the moisture content of the ammonia; however, the moisture content of the dissociated gas can be readily determined by measuring its dewpoint.